Government support services and resources have traditionally assumed that domestic violence victims are female and perpetrators male. Thus while many services have been established to meet the needs of female victims, the needs of male victims remain largely unmet. Government policy and resources have begun to change, demonstrated by studies1 acknowledging and legitimising males as potential victims, however many services are still exclusively focused on the needs of female victim and ignore the needs of male victims. This is perhaps due to public perception that still views victims as exclusively female and males solely as perpetrators. A recent viral video by the UK Mankind Initiative perfectly illustrates this gendered stereotype.2 The video demonstrates the public’s inconsistent reaction when they witness a male abusing a female and a female abusing a male. Bystanders were quick to step in and confront the male perpetrator once they witnessed him abusing his female partner. However once the roles were reversed the reactions were vastly different. Onlookers are seen laughing at or ignoring the situation as the woman physically and verbally abuses her male partner. The video highlights that the public will often disregard male victims, assuming that they are probably at fault and should endure any abuse directed at them. This societal discrimination is particularly troubling when paired with recent statistics from the 2012 Australian Bureau of Statistics Personal Safety Survey. The survey found that an estimated 448,000 men and 1,479,900 women had experienced partner violence since the age of 15.3 While the survey does show that women are more likely to experience violence, it also illustrates that violence against men is a significant problem with approximately 1 in 4 victims being men. Male victims often experience similar difficulties as female victims, such as fearing for their safety, uncertainty about where and how to seek help and the dangers that disclosure may have on their partner’s already abusive behaviour. 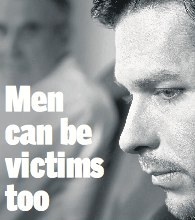 Male victims can often experience additional barriers due to their gender and prominent public belief that males are often the perpetrator. They may suffer shame, embarrassment, social stigma6 or may be made to feel that there must be something they did to provoke the perpetrators abuse. Additionally, male victims may feel that upon disclosure they may be met with scepticism and disbelief by authorities and family or friends. Police – In an emergency, call 000. The police should be called to intervene in the event of physical and sexual violence, or stalking. Ewa is completing a Bachelor of Social Science and Laws at Macquarie University with a major in Anthropology. With experience at specialist family law firms and Women's Legal Services NSW, Ewa is pursuing a career specializing in family law. Special interest areas include the care and protection of children and alternate dispute resolution, with an aim to improve access and participation in parenting matters.